Holiday dinners don’t need to be stressful! 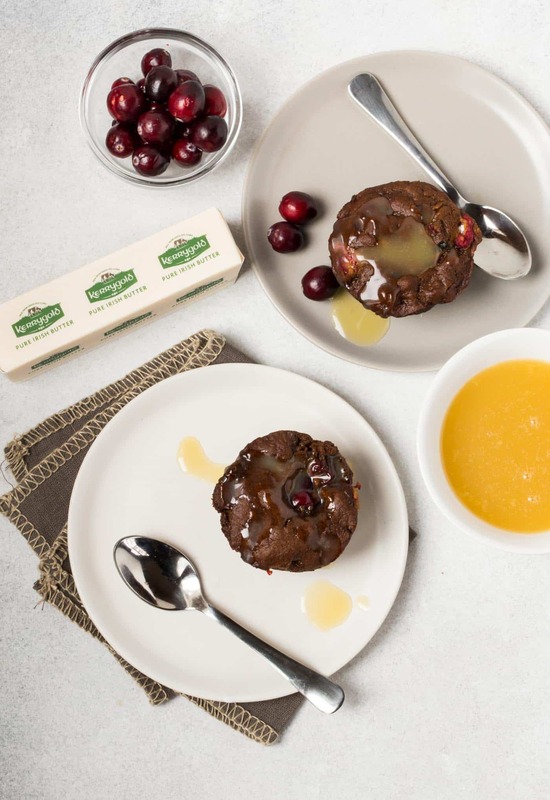 Make your dessert ahead of time with this freezer-friendly Cranberry Pudding with Vanilla Butter Sauce recipe. Here we go with tradition again. It’s Cranberry Pudding with Vanilla Butter Sauce for dessert with my family on Christmas Day. Each year as I make it, the smell of the batter brings back lots of great family memories. Years ago we would steam this Cranberry Pudding with Vanilla Butter Sauce for two hours and then hope it came out of the pan in one piece! Ugh, the stress of cooking on the holidays. Who needs that? This year I decided to make them in a muffin pan. Quick to bake, easy individual servings, and they freeze fabulously – stress alleviated! This long-time family recipe is made with cranberries, rich molasses and has a hint of cloves, allspice, and ginger. Perfect flavors for the holiday season. 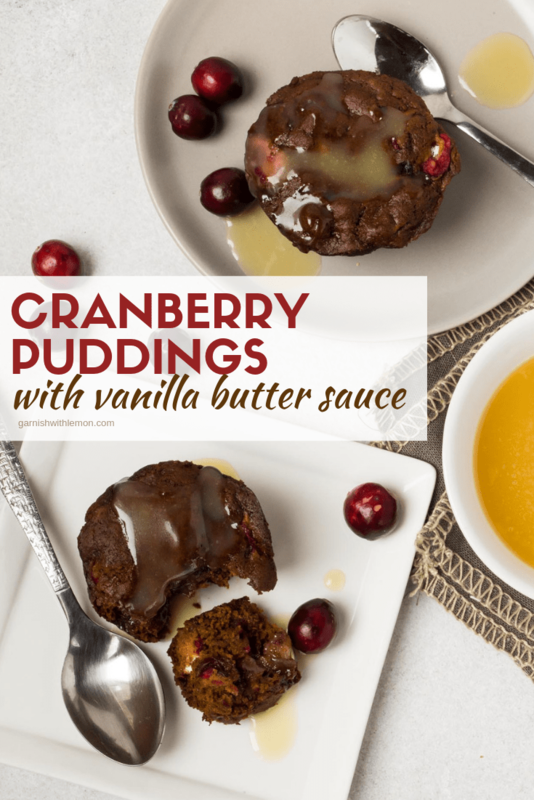 But let’s be honest, the vanilla butter sauce is what takes this Cranberry Pudding to the next level. The pudding itself is not too sweet, but the rich vanilla butter sauce soaks in every crevice so you get a little bit with each bite. And when the sauce is so integral to a dish, you certainly don’t want to skimp on the ingredients, so we used our favorite Kerrygold Salted Butter for extra richness. The result? A “just right” balance of sweet and tart and the perfect ending to a great celebration of family and friends. In my family, Christmas wouldn’t be Christmas without our Cranberry Pudding with Vanilla Butter Sauce! Tip: When serving this Cranberry Pudding, be sure to use a generous hand when spooning the sauce over the top. It is Christmas, after all, and those New Year’s resolutions haven’t kicked in yet. 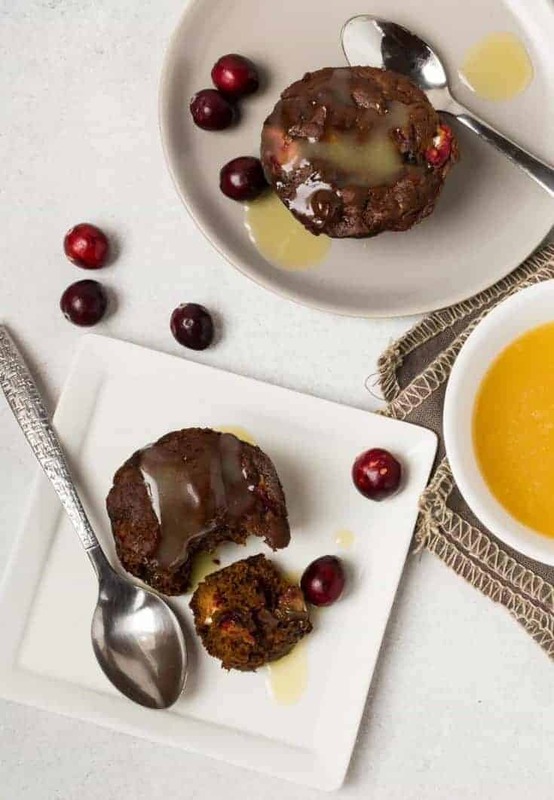 A cranberry molasses pudding with a rich butter sauce. Preheat oven to 350 and grease muffin cups. Mix spices, baking powder and flour in a bowl and combine. Add chopped cranberries and stir. In another small bowl, mix together hot water and molasses. Once combined, add the baking soda. Add to the cranberry mixture. Stir just until combined. Fill muffin cups 3/4 of the way full. Bake at 350 for 14 minutes or until a toothpick comes out clean. Place whipping cream, sugar and butter in a small sauce pan. Heat over medium heat until butter is melted and sugar is dissolved. Remove from heat and stir in vanilla. Spoon over warm pudding and serve.